High River Sauces Rogue ,has a beautful color and texture to match it’s incredible flavor! Steve and Lisa Seabury’s High River Sauces has scored a major victory with their Rogue Moruga Blood Orange Scorpion Pepper Sauce. As the label states, this is a sauce with attitude! A blend of Moruga Scorpion, Jolokia (Ghost), and Red Serrano peppers, Rogue marries the peppers with Blood Orange, apple and pear, creating a unique blend of heat, sweet, and flavor! I have to think that Steve’s mixologist wife and High River partner Lisa had a little something to do with the flavor profiling on this one!I’ve never had a sauce made with blood orange before, and I’m not really a fan of the flavor. But I have to tell you, from top to bottom, this sauce is first rate! As is the norm for my reviews, let’s look at the label. Clean, bright, with a nice bold graphic of “Rogue” that sports a neat scorpion tail incorporated in the “G”, Rogue would be eye catching on a grocery store shelf, and isn’t that the point? The label coloring matches the sauce color, as I’ve found to be the case with all of High River’s sauces, Hellacious, Tears of the Sun, and Grapes of Wrath, and it makes a very eye appealing package. And unless customers have a chance to try a product at a show, or demo, etc., the only thing that sells it is packaging and accompanying marketing. 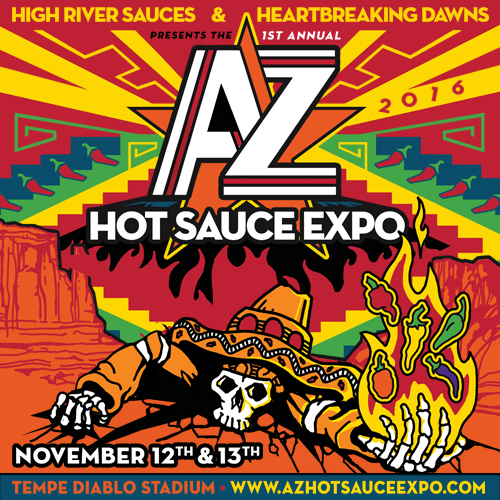 I need to say that I think Steve Seabury has one of the brightest sales and marketing minds in the hot sauce biz! From great labels to catchy product names, to the way he markets and capitalizes on his heavy metal roots, is just genius! And not to mention, the man (and his lovely mixologist bride, who I’m sure adds to the creative gene pool here) has some serious flavor and heat profiling chops! 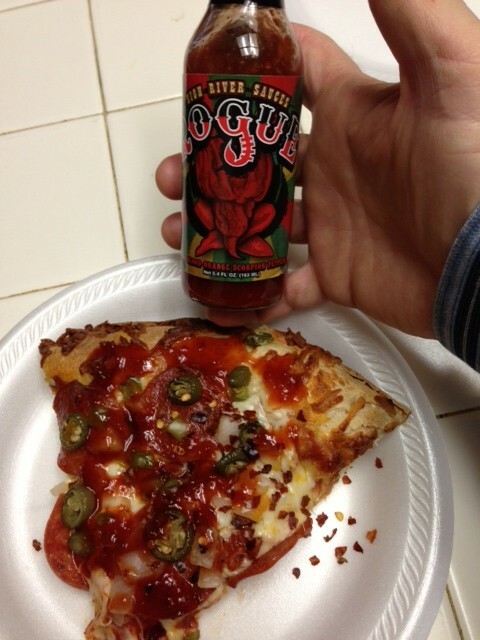 Speaking of heat and flavor, Rogue does not disappoint! I’m not a big fan of blood oranges, because I find the flavor normally heavier and bitter compared to a “normal” orange. But High River has done a masterful job capturing the full flavor of the blood orange without the bitterness by masterfully pairing apple cider vinegar with just enough apples and pears and brown sugar with the blood orange. It kinda reminds me of a good heavy metal concert – a hard, edgy look, and the promise of serious sweat-inducing head banging, but with a serious front end fake!! Rogue starts off softer than expected, like a nice acoustic ballad, and just as you wonder if it’s gonna get real, the Serrano peppers start a little lead heat rif, with a front end heat that serves to introduce the Marshall stack rattling full on heat of the Moruga Scorpion and Jolokia peppers. The background percussion rhythm section is rounded out with the ginger, lime juice, and garlic. But just like a good hard rock fan likes his music, there’s a great balance and flair to the flavor of this sauce. 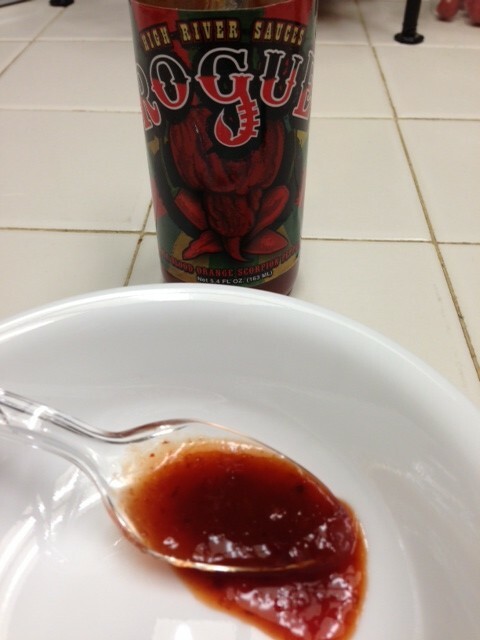 So many people criticize hard rock and metal for not having any sophistication or finesse, but just like High River’s Rogue Blood Orange Moruga Scorpion sauce, serious rock and roll comes with complexity, often times with very sophisticated classical and folk backgrounds, but using them to create a fullness of sound, or in this case, flavor and heat! This sauce is worthy of an easy 4 Fiery Worlds! I would’ve scored it a little higher, but I felt it could’ve had the heat linger a bit longer than it does before having to get another dose! But don’t misunderstand, this is a great hot sauce, unique and flavorful, and definitely worth a trip to High River’s website! And while you’re there, check out their other great sauces, like Hellacious (reviewed previously by this blogger for Hot Sauce Daily), Tears of the Sun, and Grapes of Wrath. Tell them Chilehead Ken sent you, and remember ladies and gentlemen: It’s a Fiery World!